I guess I could think of better things to do on a cloudy bank holiday than traipse around London looking for a bunch of plastic elephants, but then again – there’s plenty worse to do as well. I found my first elephant, Tigerphant in China Town last Wednesday evening and my interest with piqued. The following evening, I read Nick Curtis’ Jumbo jamboree: the elephants taking over London article in the Evening Standard and my mind was made up – I was going on safari in central London. I’m still not sure how, but I managed to persuade my girlfriend, Chrisy to join me on my quirky adventure. But join me she did around some of the most famous sights of London, in our quest to find as many of the 258 elephants as we could. 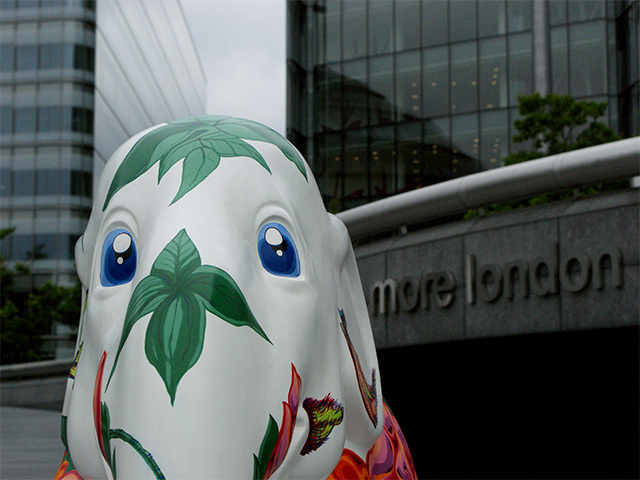 So armed with my camera and the Elephant Parade map, I met Chrisy at Bank station and we clocked our first 4 elephants (Elephant Race (Against Time), Cosmos, Taxi Elephant and The Paul Smith Elephant) while listening to the Soca & Reggae tunes of the Xc’s. Now normally I wouldn’t expect to hear the beats of Africa and the Caribbean blasting out at the Junction of Cornhill and Threadneedle Street, but then I don’t normally see thousands of people jogging along the street for the Bupa 10km run either. The band was there to support the runners and I certainly wasn’t complaining as it allowed me to start my day with a bit of winding and a spring in my step. We then walked up Cornhill to find Izzy who I spotted round the corner from where I work on Lime Street. A quick walk down to monument and we found Around the World and Mayur Gejendra. As we walked over London Bridge heading to the herd at More London, I couldn’t help but wish the sky was clearer, but beggars cannot be choosers in London when it comes to the weather. At Hay’s Galleria we found one of Chrisy’s favourites – Just Joey. Reaching More London on the south bank of the River Thames, opposite the Tower of London, we found 14 out of the listed 15 pachyderm, along with the 2 in Potters Field Park. Help! One of our Elephants is Missing. Although we’re unsure as to why we couldn’t find New Map of London, we did find Elephas Maximus, Decors, Cubelephant, Carry on up the Khyber, Hornbill, Simply Gold, Jaidayal (the triumph of kindness), Tearoses, The City in the Elephant, Marjorie, Polkadot, Simply Yellow, Roselephant, Cha-Chang, No More Plundering and Kids Co Elephant. I think one of my favourite things about seeing so many elephants so close to each other is that it gives you the ability to appreciate the different artistic styles in the designs. From the simple elegance of Simply Gold to the complexity of The City in the Elephant, where from a distance you simply see a terracotta coloured elephant with lots of glass bubbles on its skin. However, get up close and look through the bubbles and you will be surprised to see a model city with miniature elephants placed between the buildings. We then crossed over Tower Bridge heading up to the Tower Hill tube station to head over to the west end and we were surprised to find Elfreda opposite the ticket office of the Tower of London. I say surprised because the map doesn’t show any elephant in this area. However, Elfreda is clearly listed in the map’s index as being at the Tower of London. Getting off at Embankment and heading over the Jubilee Bridge to the South Bank we managed to miss 5 elephants near Cleopatra’s Needle and Victoria Embankment Gardens just behind it. Deciding to get them the next time, we carried on to the Queens Walk, where we found Brambles, deliverance, Shaanti Haathi, Untitled, Utopia, James Bond, Maureen and Sally. Again, like More London, the map indicated that there was 1 more elephant than we could find. Heading over Waterloo Bridge towards Aldwych and Covent Garden we found Ganesh and 21st century Ganesh near the old Indian Embassy building. Then outside of the Royal Opera House we found Ferrous and Charmed. A break for lunch and then we continued into Covent Garden Piazza where The Lion King on Stage, Pink Elephant, Ddj, Noah, Sunny and Flocking to the City were all lined up through the middle of the Piazza like the elephant march from Disney’s Jungle Book. As Covent Garden is busy at the best of times, getting pictures wasn’t the most straight forward task, but worth it once done. There was one more elephant at the front of the herd, but as it was being used as a vantage point by several people for one of the street acts in front of St Paul’s Church, we couldn’t get a picture yet alone see its name. 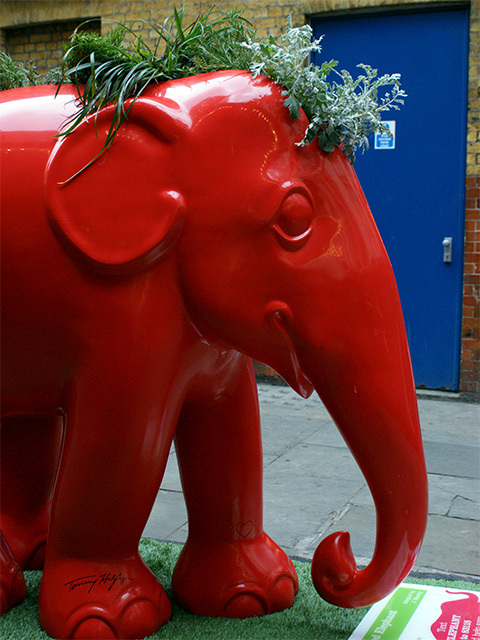 Not being sure where the eighth elephant was, we walked towards Leicester Square, via St Martin’s Court to find Figgy and the Tommy Hilfiger Red Elephant. What I liked most about the Tommy Hilfiger elephant was the distinctive use of plants to add a bit of a natural aspect to the plastic nature of these elephants. 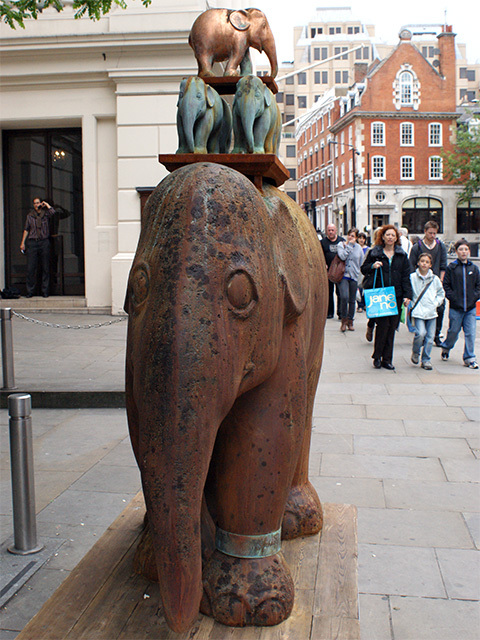 In Leicester Square we found Cholai, Heavenly Jewel, The Princess Elephant and Untitled (Gajaraja). A quick walk up to China Town and I got my picture of Tigerphant, before jumping on the bus to Constitution Hill to see the Happy Herd in Green Park. As we got off the bus we found Freedom, with its references to the great peace makers of the 20th century. While Chrisy really liked this elephant, I wasn’t so keen. I think it was the fact that the painting of Martin Luther King made him look more like a vampire which huge pointy teeth. But then again, that’s what I expected to see from this trip – different tastes and feelings being brought about by the different artistic designs. We then headed into Green Park and were treated to no less than 27 elephants. Spotty, Elefun, Karma, The Empire is not Striking Back and The Blue Macaw were to be found in one herd. In Your Trunk (Turn the Bass up), Simply Silver and Gaj Mani were in another small group. Then we found the largest herd yet. 13 elephants marching on parade towards Buckingham Palace, all different, all distinct. Nanook, The Vanishing Lotus, Harapan, Hope of Freedom, I Miss the Forest, Russell, Harmony, Polyphant, Tattoo – Born to be Wild, Eko, Will Only Words Remain?, Never Forget and Tara. Lastly in Green Park we found Fish & Chips, Mr William, Pik Bingko, BaarsFant no2, Big Heart Open Mind and Dazzlephant as we headed down towards St James’ Park. As Chrisy walks through St James’ Park on a regular basis she knew exactly where these ones were. So each of us now armed with a Flake 99 (that costs a lot more than 99p) we headed over and found Grayson, Untitled, Sans merci and Lahu Girl. Heading up to Trafalgar Square, with a slight detour to Suffolk Street to see Belle, we found all of the Indian Cricket team inspired elephants; Deccan Chargers, Kolkata Knight Riders, Rajasthan Royals, Mumbai Indians, Royal Challengers Bangalore, Chennai Super Kings, Delhi Daredevils and Kings XI Punjab. We finished the day in front of Coutts Bank on the Strand to see Pearly Prince, with its red body and sparkly jewels. How many miles had we walked – I don’t know, but I do know we walked about for about 4 hours and we saw 92 confirmed sightings. A silly and cheap day out seeing the sights of London, some fantastic art and getting a better appreciation of the plight that one of the most majestic animals on our planet is facing, because of man’s impact. Was it really that silly a day? On reflection, I don’t think so. However, one part of our safari that I didn’t like was the behaviour and attitude of some people that day. Mostly parents with their children having no respect for pieces of art or the “elephant anoraks” that took an interest in the elephants. To most of the parents the elephants seemed to be nothing more than something to let their kids play on. We weren’t the only people on safari that day and we certainly weren’t the only ones with cameras. We saw at least one primary school teacher, several Japanese tourists and many more besides, who were clearly taking an interest in each elephant. Now I don’t blame the little kids, for wanting to clamber over colourful elephants, but what was annoying and downright rude was the way that some of the parents would ignore those people trying to take a picture and just walk in front of the camera with their little ones and completely monopolise each elephant until they had finished getting their own pictures or their child was bored. Asking anyone to move their little Jimmy or Jane aside was often met with tart comments and looks including one woman referring to those people without kids as “elephant anoraks”. As a parent myself, I’d never consider teaching my son the sort of manners exhibited that day and only wish he’d been able to join us on our mad adventure round London town, so as he could see how not to behave. On a personal note, I’d have loved it if he could have joined us on safari, not least to have found out what his favourite elephant was. I suspect it would have been Simply Yellow, but with so many to choose from I can’t be certain. For myself, I think my favourite was Cubelephant although I had several favourites that also included Ferrous, Cosmos and Simply Silver. What I also liked was the thought that had gone into some of the designs. Some of the artists had clearly thought of other animals facing endangerment or other issues to be found in this world. For instance, Nanook with its Polar Bear and Arctic design could be seen to be highlighting the issue of Global Warming and the plight facing the Polar Bear, if the northern ice sheet continues to melt at the current rate. While the money that this campaign will raise will clearly go towards the Elephant Parade, the ability to raise awareness for other issues is priceless in its own rights. 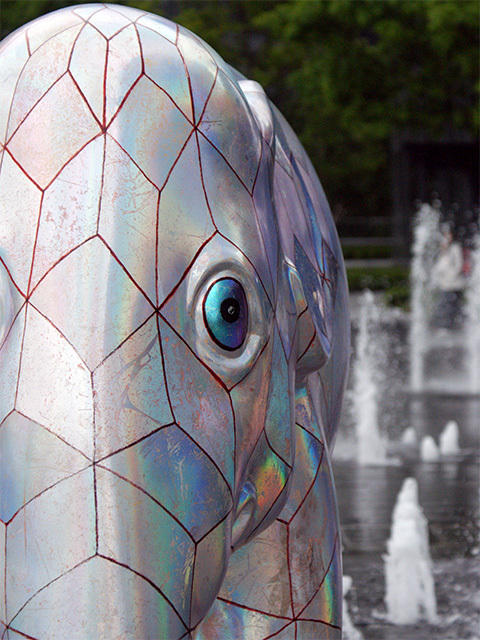 Since 2007 these decorated elephants have been invading European cities: Rotterdam (2007), Antwerp (2008), Amsterdam(2009), London, Emmen and Bergen (2010) with more due to arrive in Copenhagen next year. 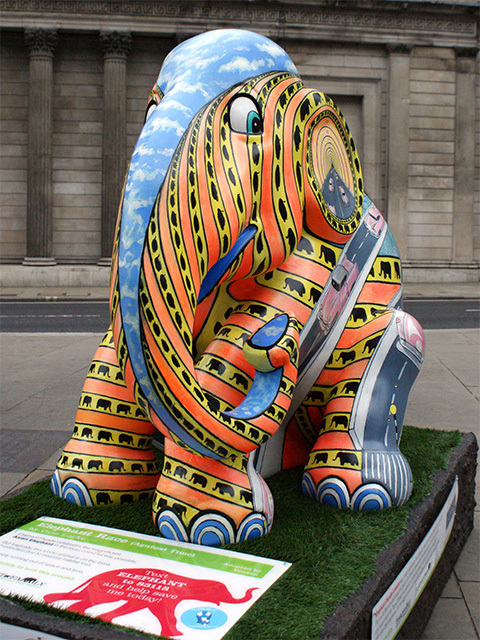 For more information please visit the Elephant Parade website. For London specific details and the route map, please visit www.elephantparadelondon.org. 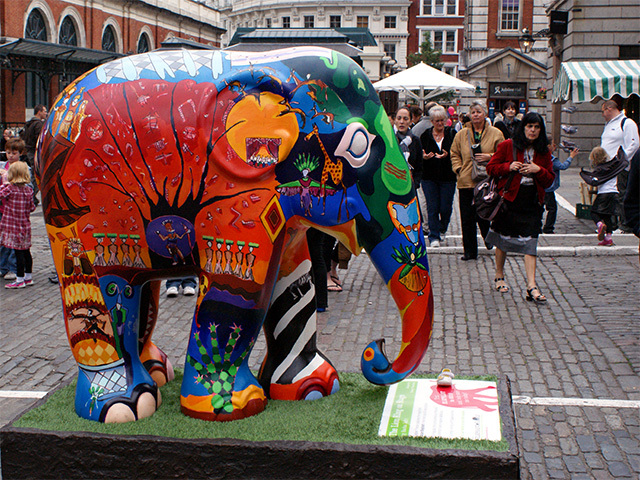 Please be aware that the Elephants will only be on the streets of London until the 24th June 2010. 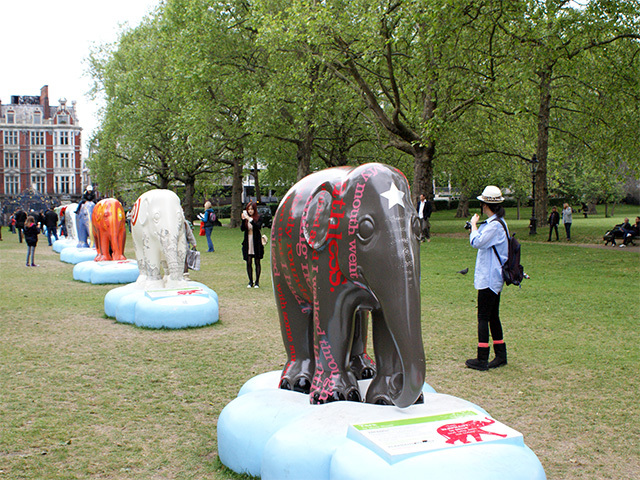 After that they will be assembled at the Royal Chelsea Hospital on the 25th, 26th and 28th June, before the Elephant Parade Mela with Goldie Hawn on the 30th June. They are then to be auctioned off on the 3rd July 2010. As you may have noticed I haven’t gone into much detail about each elephant in this blog entry. If I did I could probably write a separate entry for each elephant and having seen nearly 100 in one day that would be a lot of entries. To best understand the elephants and if you’re lucky enough to be able to make it to London in time, I can only suggest you go on your own safari and I hope you enjoy your day as much as Chrisy and myself did. Maybe you might see us when we head off to Mayfair, Hyde Park and the west end to find the majority of the rest of London’s largest herd of Elephants. After an evening of some incredible performances, I’m pleased to be able to say that the scepticism shown in my last post was proved incorrect. One of the most talented acts on the night not only went out on stage and gave a “flawless” performance, they improved so much from their semi final routine that they leap-frogged their main rivals and won the final of Britain’s Got Talent 2009. 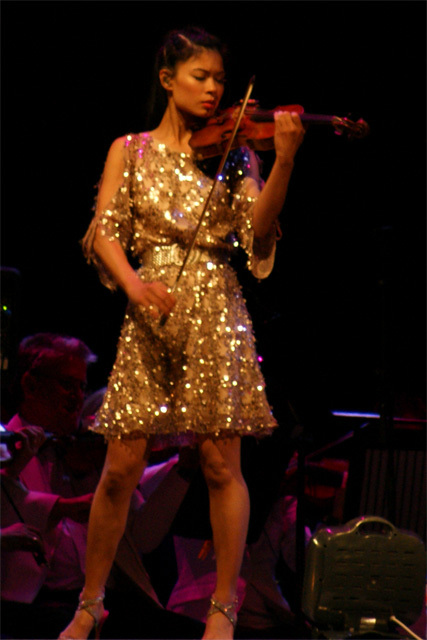 Flawless – very good but had been better in the semi final. Shaheen Jafargholi – his best performance so far, a joy to listen to. Aidan Davis – while impressive had to agree with Simon Cowell that his semi final performance was better. 2 Grand – with John missing his cue and Sally singing her best performance, it was a sweet performance but not show winning. Hollie Steel – Everyone wondered whether she’d crack up under the pressure and thankfully she didn’t – enjoyable but there were better singers on the night. Stavros Flatley – Absolutely fantastic – totally should have been in the top 3. Shaun Smith – Singing Ain’t no Sunshine and to say the least he nailed it – Wouldn’t be surprised to see an album on the shelves. Susan Boyle – Her best performance so far. Not my favourite person but it looked like the image consultants had convinced her to say as little as possible after her singing, so less annoying than usual – especially as she came a gracious second. Julian Smith – You couldn’t have asked for a better closing act. Totally deserving of his top 3 finish. I would have been as happy if he’d won. So my heartfelt congratulations to my fellow Londoner’s – Diversity, to Julian for his wonderful performances, to Stavros Flatley’s Dimitrios and Lagi for making me laugh for all the right reasons and to Shaun for reminding that sometimes the classic songs are still the best. Also my thanks to the YouTube user BritainsSoTalented, who not only allowed me catch up with the acts that I’d missed along the way, but also has given me the ability to jazz up this post with his YouTube uploads.